Are you planning to start a coupon website? Then why not use WordPress for this. There are various nice WordPress coupon themes available. You can use these themes as a ready-made platform for your next coupon website. Coupon’s business is big and you can earn big revenue via affiliate marketing. And WordPress can cut your investment budget. So, check these coupon WordPress themes and select one for your next project. I tried to curate best coupon WordPress themes from different sources. These themes are premium but worth to buy. Couponer is one of the best coupon and deals theme available for WordPress. UI of the theme is impressive with attractive color scheme. This theme is based on Bootstrap design framework and you can easily customize it. It has full membership system and lets members access coupons. It also comes with mailchimp integration. So, you can easily create mailing list to send offers to subscribers. CouponHut is a beautiful theme for creating a deals and discounts website. It comes with modern design, drag and drop page builder, custom widgets and rating system. It also includes dedicated ads blog to monetize your site. There are several pre-built pages and several features to make the management of coupon and deals easy. 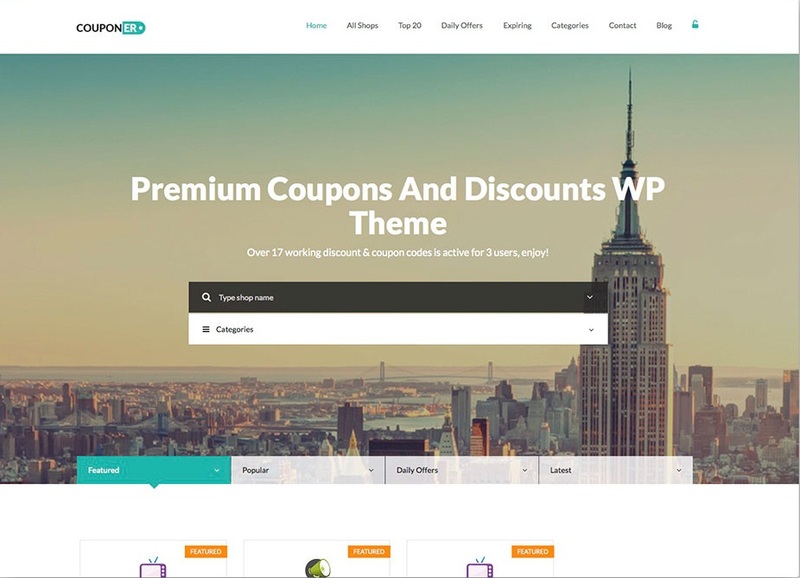 CouponXL is an awesome WordPress theme for discount, deal, and coupon website. The WordPress theme is based on Bootstrap design framework and is fully responsive. It is also SEO optimised for better ranking on search engines. It has a full membership system that allows you to choose if you want users to register for accessing or submitting coupons. It also has different type of deals and coupons. There is also a profile dashboards section that allows members to keep track of their coupons, vouchers, and deals. KUPON is another WordPress theme for creating an online market for deals and coupons. It comes with several nice features to manage the whole coupon business. This theme can also be used to sell products by using WooCommerce. It also comes with WC Vendors plugin and more. Anyone can submit deals in the site. It also support contact form 7 and child theme. Clipper is another nice WordPress coupon theme. It is easy to setup and use to start a coupon website. Thousands of people are already using it because of its powerful coupon management system, advertising management, email templates, and stats. You should surely try this theme. Couponize is a responsive WordPress theme which lets you create couponn and promo code website. It is fully compatible with latest version of WordPress 3.6. It is fully responsive and works fine on all kind of screen size devices. It is also integrated with GD Star Rating and Wysija newsletters. doo is also a nice WordPress theme for coupons and deals kind of websites. It is one of the best WordPress themes for affiliate marketing and multipurpose listing websites. Not just coupons, it can also be used for WordPress Directory & Listing websites. The theme is customizable with Visual Composer. It also has Configurable search/filter form and sorting. You can easily customise the theme according to your need. There are also various listing features. DeCoup is also a nice WordPress template for managing stores, deals and Coupons. It has a front end for submitting Coupons and Deals. You also have option to fetch data from popular sources such as MyCommerce and DataFeedr. The theme has Coupons and Deals search option. It is SEO friendly and responsive. The Deals WordPress Coupon Theme is another nice WordPress coupon theme. It is responsive and works fine on any kind of device. Coupon Store is not a theme but plugin which lets you add a coupon section in any WordPress theme. It will adopt layout automatically. This plugin lacks many option. So, I do not recommend it for creating a dedicated coupon website on this. Use this only to create a small coupon section in your blog. This plugin has also not been updated for long time. These are best couponWordPresss themes available at the time of writing this article. If you know any more coupon WordPress theme which should be in the list, share it with us via comments.